Trump To Nominate Heather Wilson As Secretary Of The Air Force : The Two-Way If confirmed, Wilson would be the first Air Force Academy graduate to hold the position. She represented New Mexico in Congress from 1998 to 2009 and currently leads a South Dakota college. Former U.S. Rep. Heather Wilson, R-N.M., has been selected as President Trump's nominee for secretary of the Air Force. 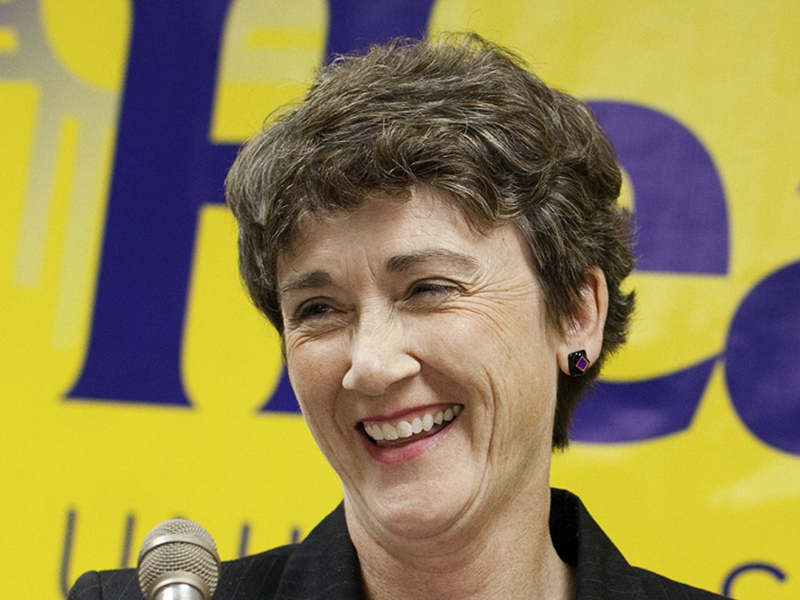 President Trump has announced his pick for secretary of the Air Force — former Rep. Heather Wilson. If confirmed, Wilson would be the first Air Force Academy graduate to hold the position, according to the White House. Wilson currently leads the South Dakota School of Mines & Technology, a public college focused on engineering and science. She represented New Mexico in Congress from 1998 to 2009. "She served as an Air Force officer in Europe during the Cold War and on the National Security Council Staff under President George H.W. Bush during the fall of the Berlin Wall and the collapse of the Warsaw Pact," according to a statement from the White House. She also obtained a doctorate from Oxford during her time as a Rhodes scholar. "Heather Wilson is going to make an outstanding Secretary of the Air Force," Trump said in the statement. "Her distinguished military service, high level of knowledge, and success in so many different fields gives me great confidence that she will lead our nation's Air Force with the greatest competence and integrity." Wilson, a Republican, lost Senate bids in 2008 and 2012. NPR reported in 2012 that she "touted her moderate credentials" during the campaign. As NPR's Greg Myre reports, Wilson would take over the Air Force as it is conducting major airstrike campaigns in Syria, Iraq and Afghanistan. Reducing costs are likely to be one of the first items of business, Greg adds. "And Trump has taken aim at the biggest new Air Force program — the F-35 Lightning II." "America and our vital national interests continue to be threatened," she said in the White House announcement. "I will do my best, working with our men and women in the military, to strengthen American air and space power to keep the country safe."